Sapa is one of the most interesting sightseeing in the north of Vietnam by many stunning destinations like hides varies wonderfully of natural scenes. Besides, Sapa is also a nest of hill tribe as Black H’Mong, Red Dzao, Xa Pho, Tay, Zay and so on. Come to Sapa, tourists will be highlighted everything in here as they enjoy the fresh air, clouds, sky, romantic scenery, majestic place, that is the reason why Sapa town is also known as the town in the cloud. 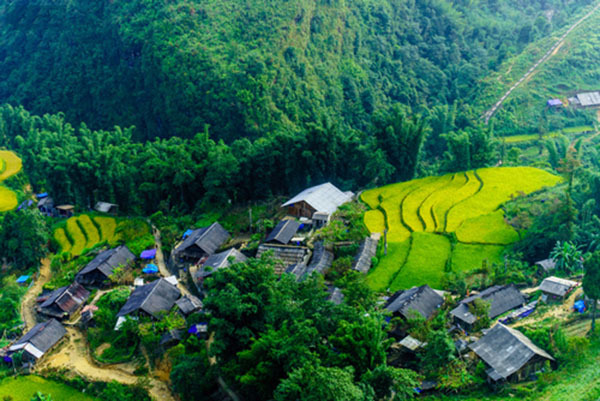 A Sapa package tour is the combination between traveling the stunning landscapes and discovering the local special markets with experiencing the daily life of hill tribe at home stay along the Muong Hoa River with the Black H’mong village Lao Chai. 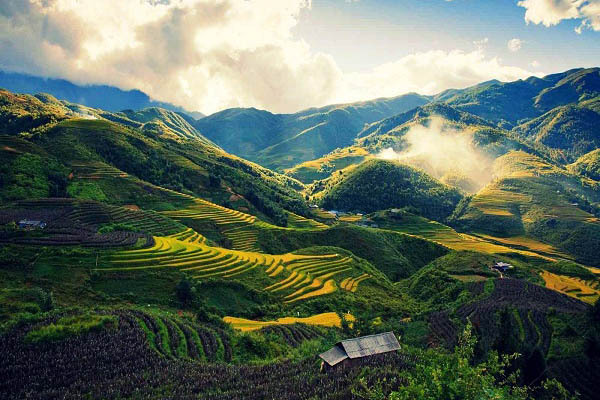 To get the best trip in Sapa, you can choose the Sapa package tour which includes all the services like a meal, transportation, homestay and travel destinations. No doubts, you will be consulted all tours to get the most suitable option. 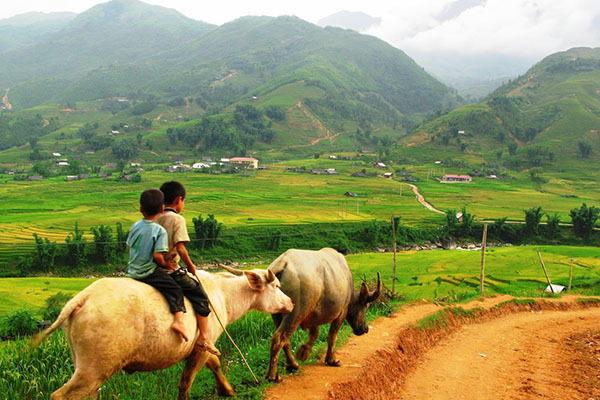 Lao Cai Welcome: Freshen up in the morning at Lao Cai railway station and start your day by trekking to several villages which help you know how Vietnamese ethnic minority’s life is. Follow a road going downhill to Cat Cat village where you will be impressed by the peacefully picturesque sceneries. You will need two hours to walk through Cat Cat Village which is located near the bottom of the deep valley right at the foot of Fansipan Peak and situated about three kilometers from Sapa Town. Cat Cat is the old village of ethnic groups which attracts tourists from all over the world for its distinctive customs and practices. Tourists can easily catch sight of women sitting in front of the loom with colorful pieces of brocade, while children playing around with pets or even livestock. In fact, it is also a good opportunity to purchase some traditional souvenirs and handicrafts right from the craftsmen such as twisting flax and weaving fabric.Continuously, you visit Y Linh Ho village which is a small village built by a ton of small hamlets scattering on the tough mountain terrain. This village is the place where the Black Mong people live. Coming here you will see they wear very dark clothing in blacks and navy dyed with indigo (often seen in the hands of older Mong women). Their houses are built on their farmland and on the mainly cultivate corn, dry rice on the steep hillsides. As a result, the only way to get to the village is on foot on the road. Moreover, you can enjoy the body and foot massage with a soothing herbal medicine. Even experienced trekkers enjoy the moment that they take off their hiking boots; better still if there is the chance of a foot massage. Continuously, you visit Y Linh Ho village which is a small village built by a ton of small hamlets scattering on the tough mountain terrain. This village is the place where the Black Mong people live. Coming here you will see they wear very dark clothing in blacks and navy dyed with indigo (often seen in the hands of older Mong women). Their houses are built on their farmland and on the mainly cultivate corn, dry rice on the steep hillsides. As a result, the only way to get to the village is on foot on the road. Moreover, you can enjoy the body and foot massage with a soothing herbal medicine. Even experienced trekkers enjoy the moment that they take off their hiking boots; better still if there is the chance of a foot massage. In the free time: Sipping a cup of corn wine and you will feel the torrid and very hot flavor and at the same time a sweet taste like the quintessence of the earth and firmament. In the morning, you will meet your local guide at your hotel, and you will be transferred to Lao Chai village, have a short trek and meet people in Lao Chai village. After that, you will be able to walk from Lao Chai to Ta Van village where the Giay ethnic minority hill tribe lives. Ta Van village is a place where many Vietnam ethnic minority groups live during a long time in harmony. When visiting the village, tourists can admire natural landscapes here, and experience homestay service, as well as enjoy traditional food of this land. This village provides a great opportunity to share their customs and home life. You will be introduced how to cook the lunch by local host then enjoy the meal in the house. After having a short rest, you will get ready for upcoming sightseeing this afternoon. Walk past beautiful terraced rice fields, you will also trek through a gorgeous bamboo forest which belongs to Hoang Lien National Park to a picturesque waterfall in Giang Ta Chai village. Giang Ta Chai located in the opposite to Muong Hoa stream and was hidden by old trees and bamboo groves. You can explore the life of ethnic minorities; admire the spectacular natural scenery with the terraced rice fields. You visit Sapa’s ancient rock with engraved images, both big and small – unique patterns of the ancients. Approaching the life of H’mong local people, you can know how they make their clothing. They buy the yarn at a local market; they still typically weave and embroider the fabric themselves. Their many crafts, their embroidery is stunning. Giang Ta Chai village offers the rice paddy fields and the stunning views on the other side of Muong Hoa Valley. The trip will be continued to Su Pan located along Muong Hoa Valley like Lao Chai and Ta Van but Su Pan village can be referred to as “mountainous commune”. Occupying the Highland on the east side of the main road about 17 kilometers from Sapa town, Su Pan. You will see the local products of this minority at its best like the rice terraces, homes and a vibrant community. You can rest your feet and take in the stunning mountain scenery with many opportunities to shoot more beautiful photos. The village is looking down to Muong Hoa valley, one of the poorest village in Sapa district and the land of this area is very poor soil. Muong Hoa valley is blooming with lots of colorful flowers in a wide range of various beauties. It is the time that the rice terraces are full of water at which you can contemplate one of the best scenery like the reflection of the sunshine on the fields’ surface. Silver fall is located about a half hour from Sapa town that offers stunning views over surrounding mountains and lush forests belonging to Hoang Lien National Park. After taking a rest nearby a waterfall to refresh, you will start climbing uphill to a road, the car and your driver are ready for your journey back to Sapa. In the morning: You will enjoy the breakfast in the high land and you have a chance to grace overview from above. After that, experience the noisy atmosphere at Bac Ha market the largest market in the region, here you will meet Flower Hmong (Red Hmong), Black Dao, Tay, Nung, La Chi, Phu La and other minority groups. They come from far and wide to buy and sell a wide variety of goods and livestock, to exchange news. Each of the ethnic groups offers the different products to make the variable value. Coming here, you can buy homemade handicrafts and clothes made from herbal remedies and meats such as chicken feet, horse legs, even dog to local crafts. Not only that, you can enjoy the strange tastes of the local foods such as Cap Nach pork, seven-color sticky rice, corn wine, Thang Co and so on.Another place in Sapa package tour is Ban Pho village which located in Bac Ha district. You spend 2 hours to approach this village, which is very famous for its specialty “corn wine” and owning some of the kindest people you will meet in Vietnam. Ban Pho village where is a mountainous commune-Flower H’Mong people live. Under Fire Mandarin – the language of a common ethnic group on the northern border strip, the word “city” refers to the concentration of population and restaurants, even a small restaurant. Ban Pho village now has nearly 500 households, of which 99% are from Mongolia. 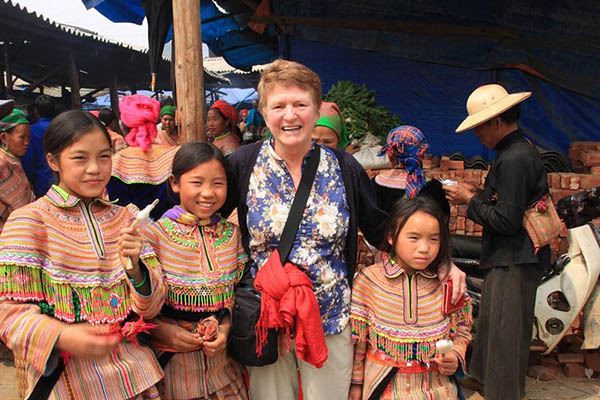 Another place in Sapa package tour is Ban Pho village which located in Bac Ha district. You spend 2 hours to approach this village, which is very famous for its specialty “corn wine” and owning some of the kindest people you will meet in Vietnam. Ban Pho village where is a mountainous commune-Flower H’Mong people live. Under Fire Mandarin – the language of a common ethnic group on the northern border strip, the word “city” refers to the concentration of population and restaurants, even a small restaurant. Ban Pho village now has nearly 500 households, of which 99% are from Mongolia. You will come back to Sapa town. You have two options. The first option is to continue visiting another place in Sapa town like Sapa Stone Church. The second option is having the relax before returning to Hanoi capital. Finally, you will be picked a safety to the beginning point.